Here are five comic masterpieces by Preston Sturges, who has been called "Hollywood's greatest writer-director, with emphasis on the former." The scripts are drawn from the great period between 1939 and 1944, which Andrew Sarris called "one of the most brilliant and most bizarre bursts of creation in the history of cinema." They are astonishingly readable and deliciously funny. Brian Henderson's introduction provides an overview of Sturges criticism and brief biographical material. Each script is preceded by a prefatory essay discussing its evolution. The insights provided by this volume will be useful to film students and aspiring screenwriters, and fascinating to anyone interested in screen comedy. 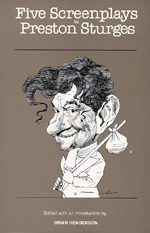 Virtually all the illustrations, showing Sturges at work, are published here for the first time. The collection includes The Great McGinty, Christmas in July, The Lady Eve, Sullivan's Travels, and Hail the Conquering Hero. Preston Sturges (1898-1959) was a member of Hollywood's gifted royalty. He wrote, directed, and produced a remarkable number of successful films and wrote and produced for the Broadway stage. Brian Henderson is Professor of Film and Chair of the Department of Media Studies at the State University of New York, Buffalo.